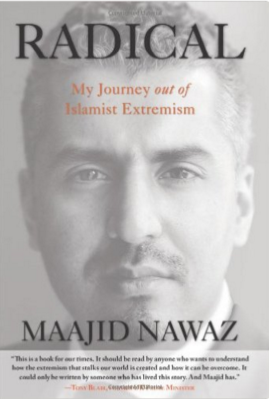 The following passages in Radical: My Journey from Islamist Extremism to a Democratic Awakening by Maajid Nawaz caught my attention: I thought it made a few points worthy of wider attention. Maajid Nawaz was once a leader in a radical Islamist group Hizb ut-Tahrir and is now the chairman of Quilliam, a counter-extremism think-tank. Radical is his biographical account of how he become involved in an Islamist extremist movement and what led to his leaving extremism behind. Formatting and bolding are my own. Important to grasp is how Islamism differs from Islam. Islam is a religion, and its Shari’ah can be compared to Talmudic or Canon law. As a religion, Islam contains all the usual creedal, methodological, juristic and devotional schisms of any other faith. . . .
Superseding all these religious disagreements, and influencing many of them politically, is the ideology of Islamism. Simply defined, Islamism is the desire to impose any given interpretation of Islam over society as law. Understood this way, Islamism is not another religious schism, but an ideological thought that seeks to develop a coherent political system that can house all these schisms, without necessarily doing away with them. Is there a problem if Islamism remains non-violent? If the dangers of racism are apparent, even in a non-violent form, then it was the same for Islamism. But what was the problem with Islamism so long as it remained non-violent? Was it not the right of Muslims to adopt whatever ideology they chose? Of course, it was the right of Muslims to believe that one version of Islam must be imposed as law over their societies, just as it was the right of racists to believe that all non-white people should be deported from Europe. But the spread of either of these ideas would achieve nothing but the division and Balkanisation of societies. If the dangers of racism are apparent, even in a non-violent form, then it was the same for Islamism. Communalist identity politics, self-segregation and group-think are far more damaging to societies in the long run than the odd bomb going off here or there, because it is such a milieu that keeps breeding bomb-makers. . . . . So, slowly, and alone, I began to unpick the last thirteen years of my indoctrination, concept by concept. Ideas that I had once held sacrosanct were unravelling in my mind as crude political deceptions. My whole character would have to change. Every moral frame of reference that I had built up in my mind required re-evaluation. I was not merely questioning jihadist terrorism . . . . That was easy. No one really deserves a thank you for promising not to randomly kill you. No, I needed to go further. I needed to question the very basis of the ideology itself. The idea that an interpretation of Islam must be imposed as state law now seemed to me unIslamic, counter-productive and anathema to what was fundamentally just. This stifling, totalitarian victimhood ideology had taken the responsibility for reform away from our people, by simply finding satisfaction in blaming everyone else for our ills. My political grievances were still there, but I saw now that we no longer required Islamism in order to campaign against them. Islamism had in fact become one of the grievances that needed challenging. As I began to formulate this idea, the sheer scale of what we needed to do hit me. By now, Western governments, Muslim-majority governments, media, and hundreds of thousands of Muslim youth globally had all come to assume that Islamism was Islam. Leaving Islamism was one thing, but outrightly challenging it was another. But who better to do it than someone who knew the ideology inside out. My head felt heavy as I took in the enormity of the task ahead. Most Muslims are not Islamists but the organised minority dominated the discourse. Islamism had been creeping upon Muslims for over eighty years now, and little had been organised to directly challenge it. Yes, certain Muslim associations have been stressing a tolerant Islam, but this was not sufficient. The good Islamist will merely co-opt that message into his political ideology, as we did. We tolerated the different strands of Muslim theology and we were well disciplined when engaging with non-Muslims. By doing this, our aim was to co-opt everyone into our political goal, regardless of narrow sectarian concerns. Unless all communities, but especially Muslim communities, stood together to reclaim the faith we would have no chance of challenging this ideology that had grown among us. It also meant that certain leftists and well-meaning liberals needed to stop pandering to a global totalitarian theo-political project. It meant, crucially, that normal Muslims needed to take a stand by closing their doors to Islamism. Most importantly, Muslim leaders and theologians needed to be firm in the face of this ideological onslaught against our faith. And while theologians are especially responsible for leading the Muslim resistance against Islamism, Muslims could not be expected to do this if Islamism’s twin, Islamophobia, was not also challenged. And though not all criticism of Islam is Islamophobia, there are those out there who harbour an irrational fear of Islam. Islamophobes and Islamists have this much in common: both groups insist that Islam is a totalitarian political ideology at odds with liberal democracy, and hence both insist that the two will inevitably clash. One extreme calls for the Qur’an to be banned, the other calls to ban everything but the Qur’an. Together, they form the negative and the positive of a bomb fuse. . . . These ideals, this counter-narrative: a respect for basic human rights, pluralism, individual freedoms, faith and democracy had to be reconciled with Islam not in the ivory towers of academics, but out there in the hearts of the masses. To do that, we needed to permeate all elements of society with the counter-narrative: politics and policy, media, the arts, social media, academia and public opinion. We needed the backing of states, parties, coalitions and movements, and we needed ideas, narratives, leaders and symbols, all pooled together, just as Islamism had been doing since the 1920s. For decades Islamist cadres had been busy branding and propagandising for their ideology at the grass roots of their target societies, while Muslim liberals either detached themselves in their mansions or embroiled themselves in the corrupt politics of their regimes. As Islamists, we would look upon these elite Muslim liberals as completely out of touch and detached from the sentiments of their people. Was it any wonder then that Islamism had become the most effective social phenomenon among Muslims globally, in dictatorships and democracies alike? Dictators would either try to co-opt it, or brutally suppress it. Both tactics inevitably aided its growth. In democracies, electoral politics could only react to votes, and if the most organised bloc is the Islamist bloc, they will have their way, intimidating government after government with their opportunistic use of Islam to influence policy. Why were governments everywhere scared of upsetting the sleeping giant of Islamism? Why had they gradually succumbed to the Islamisation of their societies? Why did they not fear a similar internal democratic lobby? Where was the democratic intimidation? What I saw clearly now was the need for a radical new social movement, a Muslim Brotherhood equivalent, sitting above short-term party-political goals, which advocated the democratic culture among Muslim grass roots: a civic-democratic intimidation pushing for democratisation. . . . .
To underscore the difference between Islam the religion and Islamism the ideology, as well as the way Islamists have dominated the dialogue and confused the ideas of Islam and Islamism for many of us today, read the following excerpt from an earlier biography by a friend of Maajid Nawaz, Ed Husain. Both were friends for much of their time in Hizb ut-Tahrir and again after they each, separately, left that movement. 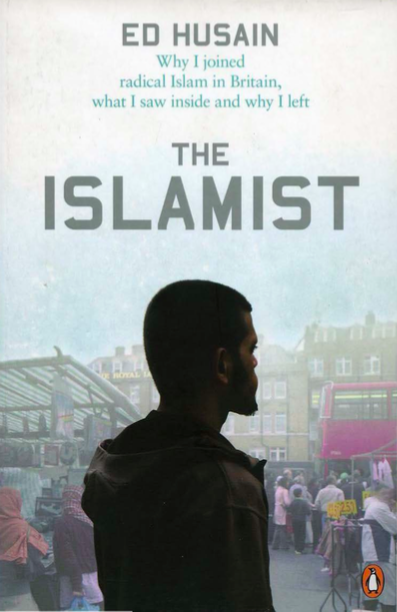 Ed Husain’s book is The Islamist: why I joined radical Islam in Britain, what I saw inside and why I left. Ed had been describing his upbringing in the Muslim faith as a spiritual experience without any reference to politics. His Muslim parents integrated well in the diverse cultures in their British neighbourhood. It was at a Religious Education class where Ed first encountered the concept of Islam as a way of life that embraced politics, the state, and how society itself functioned. The first book I read about Islam in English was Islam: Beliefs and Teachings by Gulam Sarwar. My parents and Grandpa had taught me Islam without books, but via an oral tradition, partly because of a lack of books in English on Islam for children, but also because they believed Islam was an internal condition, to be instilled in human hearts by teachers, not lifted from dry pages. But I had always been an avid reader; and now warmed to the idea of reading about Islam in English. Sarwar’s book filled a gap. At school, Sarwar’s was the main textbook for those studying RE. I set out not only to read it but to ensure that I understood it thoroughly. Whether I succeeded or not, one part of the book has stayed with me. I had been taught that Islam was a path that would draw me closer to God. During my reports of the political situation in the Middle East, Grandpa had never spoken about an ‘Islamic state’. In all his discussions about his most beloved Prophet, Grandpa had never portrayed him merely as a founder of an Islamic state, a political leader. In all the books Grandpa read, the chapters he discussed with his students, he never raised a subject known as ‘Islamic politics’. Yet, in Sarwar’s book, there was a chapter on the ‘Political System of Islam’. From a young age I had been exposed to politics: my father’s addiction to the news, Attlee’s statue outside my local library, family visits to Gandhi’s Kingsley Hall, discussions about Churchill, and my father’s acquaintance with our local MP, Peter Shore, all meant that I had strong political roots. At no time, however, did I hear complaints from the thousands of Muslims I met while travelling with Grandpa about the need for (or the absence of) an ‘Islamic state’ or a ‘political system of Islam’. Religion and politics are one and the same in Islam. They are inter-twined. We already know that Islam is a complete system of life . . . Just as Islam teaches us how to pray, fast, pay charity and perform the Haj, it also teaches us how to run a state, form a government, elect councillors and members of parliament, make treaties and conduct business and commerce. In concluding his introductory chapter Sarwar wrote that there was no Islamic state in the world today in which Islam was a system of government. He commended the efforts of several organizations that were dedicated to the creation of ‘truly Islamic states’ and mentioned several groups by name, including the Muslim Brotherhood in the Middle East and Jarnat-e-Islami in the Indian subcontinent, which were working for the ‘establishment of Allah’s law in Allah’s land’. Today, in British schools, Sarwar’s book continues to be used in RE classrooms. In mosques and Muslim homes across Britain it is promoted as an introductory text for young Muslims. What I did not know at school was that Sarwar was a business management lecturer, not a scholar of religion. And he was an activist in the organizations that he mentioned. Sarwar’s book was not the dispassionate educational treatise it purported to be. . . . I, at sixteen, was already wondering why my parents had never spoken about this most important aspect of our religion, the Islamic state. In all my discussion with traditional Muslims during the recent Gulf war, why had no one made it clear that religion and politics are ‘one and the same in Islam’? And why had none of us sought to ‘establish Allah’s law in Allah’s land’? And if this was what movements such as the Jamat-e-Isla1ni and the Muslim Brotherhood were aiming to do, well, what was wrong with that? Sarwar wrote about ‘Islamic movements’ in the Muslim world as perfectly normal developments. But I recalled Grandpa and his students, many of them clerics trained in madrassas in India and Bangladesh, talking about the Jamat-e-Islam.i in disparaging terms. I had heard many of these conversations taking place between imams in various towns, and they complained about the increasing influence of jamat-e-Islami activists in their mosques. . . . .
Posted on 2015-10-26 11:46:02 GMT+0000 by Neil Godfrey. This entry was posted in Religion and tagged Islam, Islamophobia, Nawaz: Radical. Bookmark the permalink. Islamophobes and Islamists have this much in common: both groups insist that Islam is a totalitarian political ideology at odds with liberal democracy, and hence both insist that the two will inevitably clash. One extreme calls for the Qur’an to be banned, the other calls to ban everything but the Qur’an. I’m mulling over the affinities of this statement with some comments I happened to read today from British philosopher John Gray in his book Black Mass. Gray’s book is is a critique of what Gray identifies as the distinctively modern tradition of millenarianism inspired by the Enlightenment, a tradition continuously invoked by those who justify the imposition of utopia at the point of a sword. Among the many points Gray makes is that for all the popularity of “clash of civilizations” narratives that pit a secular, liberal-democratic West against barbarian Islamism, in fact the two are twins; they share a common intellectual heritage, that of the European Enlightenment and all the radical, totalizing, tradition-destroying, world-transforming political projects to which it gave rise. Islamism as a movement distinct from the Islamic mainstream has its roots more in “Western” secular thought than in the native traditions of the Islamic world. In Gray’s view the epithet “Islamofascism” is facile not because the purported connection between Islamism and fascism is an overreach, but because, in a sense, it doesn’t reach far enough: according to Gray you could as easily call it Islamo-Leninism or Islamo-anarchism, or even Islamo-Jacobinism, but to fully reckon up the affinities of radical Islam with Enlightenment ideologies would equally indict the cherished projects of many Westerners, such as neoconservatism and neoliberalism – both of which anoint a particular politico-economic model as The Future and attempt to export it to all corners of the world, by force if necessary. Ed Husain (also in The Islamist) explores the intellectual roots of Islamist critique of Western society and finds they are not lodged in Islamic tradition but actually in Western intellectual tradition — Hegel and Rousseau in particular. I know there is widespread criticism of the Enlightenment as being the womb of subsequent totalitarianism. I have a difficult time accepting that interpretation. I see Taslima Nasreen has tweeted a photo of her with Maajid today, where she refers to him as an atheist. This follows on from an earlier incident where Ayaan asked Maajid when he is going to renounce his faith and he replied with something to the effect of “watch this space” (I forget the exact reply). I think it is very likely that Maajid isn’t a Muslim at all, but he just pretends he is so he gets the legitimacy of being the “reformer from within”. The idea of secular (atheist) Jews is well accepted. I argue that Jews in this case are not a race, but a culture. Why not then atheist Muslims? One can remain part of a community even if one publicly rejects some of the dominant beliefs of that community. It is the responsibility of each and every religious person to choose to be selective when interpreting their holy scripture. Followers of the Judeo-Christian tradition could easily choose to annihilate their opponents by proof-texting scriptures like 1 Samuel: “Now go, attack the Amalekites and totally destroy all that belongs to them. Do not spare them; put to death men and women, children and infants, cattle and sheep, camels and donkeys (1 Samuel 15:3).” The issue is not that the bible has passages like this, but that the followers are mature enough to ignore them. The issue is not what the holy text says, but whether the follower has a mature, ethical, and responsible approach to it. The issue is not whether the Koran teaches violence (because the bible does too), but whether certain Muslims are choosing to convey authority on the violent parts. “Religion and politics are one and the same in Islam.”—I don’t see it…..Unless we are only looking at Modern “Islamism”. Modern Islamism isn’t about Trusteeship—but about Power— the (Western) Secular project was also about wrestling “power” away from Christianity onto another ideology—that of Secularism. Ethical governance should be important enough for all citizens to contemplate. If those in the Muslim mainstream want to contemplate ethical governance—particularly in light of their traditions and values…they should be able to do so. But…any governance or civic system that is oppressive and/or unjust is unethical—and simply hanging the label “Islam” onto it does not change its nature. The first principle of any Just (and therefore ethical) system is Equality. How this is understood and implemented will promote or hinder justice. Ed Husain is agreeing that the passage is expressing Islamism as opposed to Islam. Ed has many places where he describes an inner spiritual religion and would, I think, not even go as far as you do in seeing it as entering the area of a “social project” as such.